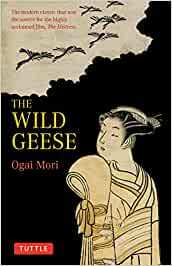 In The Wild Geese, prominent Japanese novelist Ogai Mori offers a poignant story of unfulfilled love, set against the background of the dizzying social change accompanying the fall of the Meiji regime. The young heroine, Otama, is forced by poverty to become a moneylender's mistress. She is surrounded by skillfully-drawn characters-her weak-willed father, her virile and calculating lover (and his suspicious wife), and the handsome student who is both the object of her desire and the symbol of her rescue-as well as a colorful procession of Meiji era figures-geisha, students, entertainers, unscrupulous matchmakers, shopkeepers, and greedy landladies. Like those around her, and like the wild geese of the titles, Otama yearns for the freedom of flight. Her dawning consciousness of her predicament brings the novel to a touching climax. Start reading Wild Geese (Tuttle Classics) on your Kindle in under a minute. Ogai Mori (1862-1922) stands in the foremost rank of modern Japanese novelists. His professional success as an army surgeon was outstripped by his even more brilliant ascent in the literary world of the Meiji and Taisho eras. His work is characterized by a strong humanistic element, a romantic quality effectively tempered by realism, and a lucid style that often rises to lyric intensity as in the closing passages of The Wild Geese . Written in 1913, The Wild Geese enjoyed such success in Japan that it was made into a film, shown abroad as The Mistress. 4.0 out of 5 starsThe coflict between love and surperstition!! This love story of a girl who became a lover of an old bill collecter and fall in love with a medical student is a sign of japanese mentality in the drastic changing situation between the periode "Edo" and periode "Meiji". As his first novel "Dancer"in wich he told his uncompleated love in Germany(at that time,having a foreign wife was a taboo), Mori tried to show the example of a conflict of natural feeling of love and the traditional superstition.Why the girl could not acheave her love? In Japan they said that a real love is a love forbidden, but it is sure that what Mori wanted to say in this book is not that beauty. I am so happy to have found the book that my great-uncles were reading when they came up with my grandmother's name. Grandma gave the name to my mother, I took it for myself (I liked it so much) and then gave it to my daughter. I just love having the story I heard all my life come to reality. Much of Japanese literature hasn't been translated to English so most readers will find the narrative inadequate and the ending disappointing. However, fans of Japanese literature will appreciate the style, though typical for the milieu, used in 'Wild Geese'. In The Wild Geese, a tale set in the thirteenth year of Emperor Meiji's reign, an invisible narrator introduces the reader to the handsome Okada, a handsome medical student. During his regular walks through the city he becomes enchanted by an "oval and somewhat lonely" face that smiles at him each day from a window. That face belongs to Otama, the mistress of Suezo, a vain, parsimonious moneylender. Otama's only friend is her weak father, who depends upon her for support. One day a snake slithers into Otama's birdcage and snatches one bird fast in its jaws, while the other bird flails to escape. Okada slices the snake apart and saves the remaining bird. Otama herself is the caged bird, Mori implies; the snake not just Suezo, or her ineffectual father, but the patriarchy that traps her. Mori drives the point home when Okada kills a wild goose in a lake. Otama was infatuated by Okada's freedom to do whatever he wished. Otama's wings were crushed before she could use them, while Okada flew away. Otama formulates a plan to meet Okada, but it backfires, and Okada leaves the country the next day. The narrator called Okada the "hero" of the story, but Okada was a man who felt "a woman should be only a beautiful object, something lovable, a being who keeps her beauty and loveliness no matter what situation she is in." . The two never meet; or, do they? The author suggests there is more to the story, yet refuses to reveal the ending. The Wild Geese is full of allusions and hints, painting a watercolor tale as lovely and enigmatic as Japan herself. Since I love classics from any country and especially enjoy novels from Japan, this was a logical choice for me. I wish it had more pages but no matter since the novel was excellent. If you are interested in Victorian Japan, this novel gives an excellent description of the people and the country during that time period. The author gives many tiny details, which are all significant since they give the reader a window into which one can view Japanese society in the nineteenth century. It arrived ahead of time, and I couldn't wait to read this book.